Built in the early 20th century and included in the list of New Zealand Historic Places Trust, the Ferry Building stands out against the harbour owing to its rich Baroque architecture. The building functions as a part of the Aukland Ferry network and also has some of the best restaurants in the city. Take a walk around the building to witness its grand design and wrap up the visit with a warm meal at one of the restaurants, to later take a romantic walk along the harbour. For prices of ferry rides, visit the official website. Recommended time of arrival is 8:00am to 9:00pm. Timings of individual shops and ferry operators vary. For more information visit the official website. How popular is Ferry Building? People normally club together Saint Patrick's Cathedral and Queen Street while planning their visit to Ferry Building. A hub for ferries interconnecting to the nearby islands and a popular historical landmark, it's something that Auckland city still has until all those years. There is a famous gelato shop and high end restaurant, followed by with some souvenir and honey shops in the back. It's worth a visit, especially if you're on a lime zooming around. Great views of, within and through this remarkable early Auckland building. Plenty of food outlets ensures that it is always crowded. The ferry building needs a further upgrade. The layout for ferry departures is confusing. And the mix of heritage architecture and passenger flow needs a clearer design. However, this is a people place and is always enjoyable to travel through. 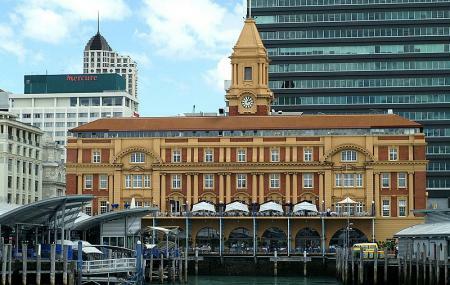 An old building at the waterfront of Auckland's downtown, in front of the downtown ferry wharf. After it got renovated and strengthen, it's now houses several upscale restaurants; unfortunately, the best feature of those restaurants are the view. Especially with their price tags. Luckily some of the non-restaurant vendors are quite good.